Bus drivers in Edinburgh are to be balloted over strike action. Unite the union has confirmed it will formally ballot its Lothian Buses members for industrial action next month. It follows union claims about bullying and harassment by management at the City of Edinburgh Council-owned company. Lothian Buses has accused Unite of being "unwilling to engage in serious discussion" to resolve the dispute. The latest plans for a ballot come after a three-week consultative ballot found 94% of union members who took part indicated support for industrial action. That followed the sacking in December of a bus driver and the suspension of 10 others in connection with posts on a Facebook page. 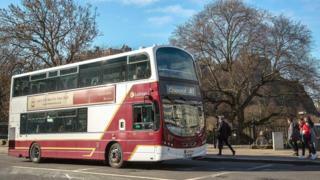 Unite accused Lothian Buses management of axing time off for union bosses to carry out duties, which members claimed was in response to collective grievances being lodged over poor workplace relations. Talks to resolve differences between the two sides broke down last week at the Advisory, Conciliation and Arbitration Service (ACAS). Lyn Turner, Unite regional industrial officer, said: "If we do go ahead with industrial action it could be from buses not being on the road to working to rule. "The last thing we want to do is take industrial action, but if our arms are being tied by the company, then we will have no choice than to use all options available to us." A spokeswoman for Lothian Buses said: "Despite the fact that the union and the business attended talks with ACAS last week, Unite thus far seem unwilling to engage in serious discussion. "We absolutely refute any allegations of bullying. "The branch chair and secretary are allocated four days per month to attend to their union duties - time which is paid for by Lothian and is way above what we are required to provide by law. "We are at a loss to understand why the union hierarchy is intent on pursuing this damaging course of action that has the potential to impact on our customers."